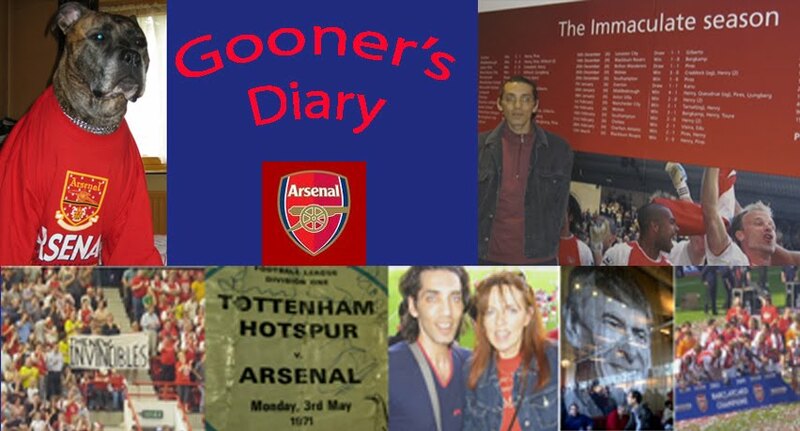 Gooner's Diary: Arsène Wenger involved in hail Mary tactical masterstroke shock! Arsène Wenger involved in hail Mary tactical masterstroke shock! It was a brave move by le Boss, withdrawing Alex Song with 20 minutes to play. With Alex walking a yellow card tightrope since the opening minutes of this match, I suppose it was a considered gamble because as fatigue began to take it's toll as the clock ticked down, there was always the risk of the game getting stretched and Song being forced to stick an inadvertent leg out, thereby missing the second leg by getting himself sent off. I felt we needed to score early in the second half, if we were going to get anything out of this game, in order to energize both players and fans alike. But like most everyone present tonight, I would've long since settled for the 1-1 draw which would have left me travelling to Camp Nou in a couple of weeks time, still clinging to the feeling that we had plenty to play for. Strangely enough, my ticket for the second leg turned up in the post this morning. I'd pondered whether this was mere coincidence, or by design, with the club thinking that they had better get these tickets sent out, lest a 0-4 thrashing resulted in a rash of demands for refunds. On opening the envelope to discover my gateway to a seat up in the gods of the Camp Nou enclosed, I couldn't decide if this was a good, or bad omen. I wondered if I'd be coming home this evening thrilled at the sight of my right of entry to the return match sitting in its place of honour on top of my bedside table, or would I be returning with my tail between my legs after another Barca spanking, wanting to bury this all too visible reminder of the money I'd wasted on a trip that I'd be looking forward to, like a hole in the head. Mercifully I've no need to worry about finding the enthusiasm for an outing to the Catalan capital, following a truly magical evening at the Emirates, of the sort that we've been waiting for ever since we moved in to the new gaff, so as to finally start the ball rolling with the sort of ecstatic encounters that will begin the roll call of genuinely historic results, to lend the place the sort of memories that echoed around T (former) HOF. For a moment there this evening, as I made my way to my seat and caught my first sight of all the flag waving, amidst the electric big game hullabaloo of atmosphere that only occurs on such special occasions, I experienced a nightmare déjà vu of that miserable evening against Man Utd the season before last, when our cacophonous crowd was silenced in the six minute semi, as all that atmosphere was sucked out of the stadium by gut-wrenching goals from Ji Sung Park & Ronaldo. As a result tonights game kicked off with this particular atheist praying to the footballing gods for this evening's fun to last just a little bit longer! And it almost felt like a self-fulfilling prophesy when Messi went clear early on and we all held our breath as his unusually wayward chip over Wojciech slid past the far post. But it wasn't only our stadium which came of age in this evening's encounter, in a game where it felt as if both Wilshere and Koscielny enjoyed a rite of passage. While Laurent might occasionally appear somewhat clumsy and is prone to conceding the odd needless penalty, I'll gladly accept the occasional mishap from our French centre-back because as this season has progressed I've grown increasingly impressed with the conviction with which Laurent appears to do everything and I'm much happier seeing him learn from his mistakes while bowling over the opposition with his "balls out" challenges, when compared to the feint-hearted way in which some of his peers tend to waft a leg towards a tackle. As for Jack, what can I say, other than to suggest that if ever we needed confirmation, the performance we witnessed tonight proved that he was born to do the business on such big occasions. Of all the players out there in red & white this evening, including Cesc, Wilshere's ability to find space and time on the ball where none existed left me thinking that based on this performance, he'd be the one player who'd look least out of place amongst the Catalan's "greatest team on the planet". Although admittedly with Busquets and co. constantly smothering our skipper in his more advanced position, it was perhaps the attention paid to Fabregas which afforded Wilshere with the opportunity to shine in his slightly deeper role. As has been said before, with the benefit of having just struggled to stay awake to savour a replay of the game, it wasn't so much what Barcelona did with the ball in the first-half that impressed me (although this was indeed impressive enough), it was their running off the ball and the zeal they showed, hunting in packs to recover possession that stood out, along with the intuitive understanding that enabled them to incessantly find space between the line of our midfield and defence and the precision timing of the runs behind our backline (as evidenced by the fact that the replays prove their goal wasn't in fact offside!). They produced an amazing stat on the radio at half-time (but you'll have to forgive my sieve like memory for the fact that I can't recall the exact details), stating that Jack Wilshere had complete the most number of passes for the Arsenal, with something like 22, whereas the average for the Barca players was around 37, with the highest being Iniesta (I think?) with somewhere in the region of 50! Whether it was inevitable that they couldn't maintain this pace for the entire ninety, or perhaps the possibility that Barca have grown so accustomed to the opposition losing heart, once the deadlock has been broken and they can afford to slip into the sort of keep ball session that has the other side chasing shadows (talk about the biter being bit - now we know what it feels like when the shoe is on the other foot! ), but we began to take advantage of the Spanish side's definite drop in tempo after the break. It was interesting to hear Robin admit to not knowing how he'd beaten Valdes at his near post, but for my money the success of the shot was in the instinctive way he brought it down and smacked it, without the hesitation that might've given the goalie time to set himself. Whereas it seemed to me as if he was so desperate to score with his previous couple of efforts, that in thinking about producing the perfect strike, Robin dallied too long, taking the unnecessary touch that enabled the defender to pressurize him. From start to finish, the winner was a thing of beauty and seemed to demonstrate one of the changes we made second half, in mixing it up a little more, by either attempting the occasional long ball, or getting it from back to front far quicker and depriving their midfield of an opportunity to crowd us out. Lest we forget, amidst so much euphoria, it may only be half-time in this particular encounter, but so long as we do ourselves justice in Barcelona, I'm honestly not that bothered what transpires in the second leg - although obviously come the day I'll be as desperate as every other Gooner to beat the buggers! But there will be no shame in exiting the competition against the tournament's very best (by some margin). With an away goal in the bank, in their post match interviews the Barca players didn't look particularly bothered by their defeat. Although with Sagna back in the side in Barcelona and Piquet now suspended we've can be forgiven for feeling just a tad optimistic! Let me remind YOU, Anonymous, that Arsenal were ahead of Barcelona at FULL time. Just because the tie is half-over doesn't mean we haven't beaten Barca on the pitch, something your team, as yet unknown but almost certainly pathetic, hasn't done. Unless it's Inter, in which case what the hell are you doing in a forum about an English team?